Social Studies teacher Eugene Young IV, 29, was born in Chicago, Illinois and grew up in Shawnee, Oklahoma. He went to the Shawnee public schools for elementary, middle, and high school. The languages offered at his high school included foreign languages such as French and Spanish, but also Native American languages such as Cherokee, Creek, and Chickasaw. “I learned Cherokee, and I still know some today,” he said. Growing up, Mr. Young was into sports such as wrestling, football, and track. In high school he worked three jobs at the same time, at a car lot, a laundromat, and McDonald’s. His goal ever since he was a child was to attend the University of Oklahoma for college. This goal was accomplished when he was accepted, “I also earned a scholarship for wrestling,” he said. His biggest regret in life was in the athletic realm. “As a sophomore in high school I made it to the state semifinals in wrestling, and then lost the match in the last five seconds,” he said. His greatest accomplishment in life is getting married and having kids. “Now I’m working to buy a house for my family,” he said. Mr. Young said that he doesn’t have any hobbies right now because he is busy raising two daughters. For entertainment he likes to watch the Marvel Netflix Originals such as Luke Cage, Jessica Jones, and Daredevil. He has been collecting Marvel’s Wolverine comics since he started making money in high school. His favorite food is from Kim’s Place, a cozy Korean restaurant in Oklahoma. “It’s about four tables in a room smaller than my classroom,” he said. He always orders the shrimp fried rice, because “it’s the best food in the world.” He has traveled to over 26 states including Hawaii, Maine, Nebraska, Iowa, and Ohio. “I don’t currently have a bucket list because I’ve already done everything on it,” he said. He’s been to Niagara Falls, Hawaii, and boated on Lake Erie. 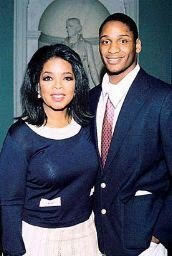 Mr. Young even got to meet Oprah Winfrey in high school. He got a $10,000 scholarship along with 164 other students to be able to travel to Washington D.C and listen to Oprah give a speech. Afterwards he shook her hand and took a picture with her. She told him, “Never, never give up.” Mr. Young says that that’s the best advice he’s ever gotten and the best advice he could give someone. Another inspiring figure in his life is Barack Obama. “I am interested in Obama’s politics and I admire him for being the first black president, I also feel connected to Obama because of his political work in Chicago,” he said. Mr. Young has also been inspired by American writer, journalist, and educator Ta-Nehisi Coates. He says he has a “really good understanding of the black community,” and is able to express himself really well with words. Mr. Young recommends reading any of Coates’ books.